"We taste, we laugh, we learn." Today’s show features Ferrari-Carano Vineyards and Winery, with Sarah Quider, the executive winemaker, Rebecka Deike, the red wine maker. They have brought several wines for tasting. Joining Steve Jaxon and Dan Berger are Patrick Mukaida, Ferrari-Carano’s director of hospitality and Barry Herbst from Bottle Barn. 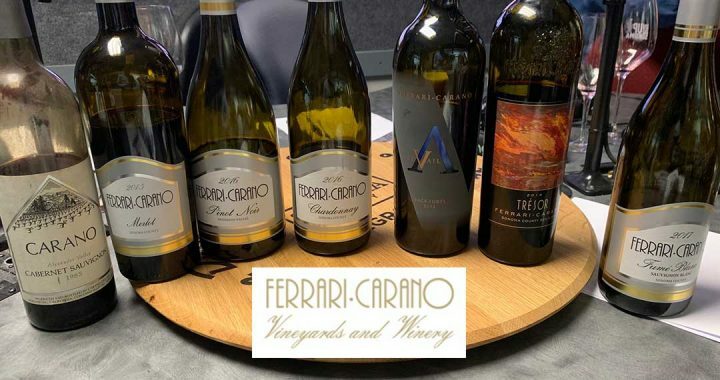 Ferrari-Carano is Tom Simoneau’s Winery of the Year for 2018, which was announced on our end-of-the-year show, a month ago. Don and Rhonda Carano came from Reno and had a hotel and casino there. They came to Sonoma County at first looking for wine to sell at the hotel but they soon became interested in making wine. They took classes and acquired some vineyards in Dry Creek Valley and made their first wine in 1981. Rebecka started in 2004 and worked with Sarah on whites for ten years before starting on the reds four years ago. They produce about 400,000 cases under all their different labels. Sarah Quider was a biologist assistant for the Pacific States Marine Fisheries Commission at Bodega Bay. She was unhappy with that so she opened a newspaper and saw an ad where Ferrari-Carano was hiring a lab technician. She worked for Jordan, got a degree at UC Davis. Rebecka was studying and working in optometry and also saw an ad for a winery intern. She has a degree in celluar molecular biology so she understood the science. Dan Berger has known Ferrari-Carano since 1986 and met Don and Rhonda Carano in 1988. Over the years their fruit and their winemaking have gotten better and better. Dan calls their winery the most gorgeous property around. First they taste a Fumé Blanc which Dan calls their flagship wine. Sarah says it came from the heat wave in 2017. They were picking as fast as they could because they had to get the fruit off the vines due to the extreme heat. It was one of the more challenging wines to make in such a short time. Dan calls it a classic western Sonoma County style, with some Russian River fruit, with its herbal notes, which go well with the tropical fruit flavors there. There is also a trace of dry hay flavor, from Alexander Valley. Sarah says they do source grapes from all those places. They get some creamyness and vanilla tones. Tom says it’s perfectly balanced between herbal, roundness and forward fruit. Barry says it’s got something for different people who like those different characteristics. They stir the lees once week from harvest to bottling. It retails for only $14. Dan brought in a 1985 bottle of Carano Cabernet from his cellar and it is still very good. It is his last bottle from that case. They used a really high quality cork, which helped it last 32 years. The next tasting is a 2016 Ferrari-Carano Chardonnay from the Home Ranch, their original property. They are up to 21 different ranches for red and white wines. Their whites are mostly Sauvignon Blanc and Chardonnay. This Chardonnay just won Best in Class in its price range at the SF Chronicle competition last month. Patrick Mukaida says that their gardens are open to the public and a daily tour at 10am is also free. They are famous for their flowers. They will have thousands of tulips up in March. They also have different kinds of cork trees and over 2,000 kinds of plants, all with ID tags. Villafiore is the building that houses their tasting rooms. Next is a 2016 Anderson Valley Ferrari-Carano Pinot Noir. Rebecka says that Christy Ackerman, their third female winemaker, made it. Dan says it has intense fruit and that there is a lot of high quality Pinot Noir coming from AV. Their Merlot is what made Tom Simoneau choose them as Winery of the Year. Rebecka says that 2015 was a year of low yields with a lot of heat and strong flavors. She explains that the fruit comes from a few different vineyeards and appellations. There are blueberry flavors from a vineyard in Russian River Valley. A vineyard in Dry Creek gets flavors more like cherry pie and they get more structure from some other higher elevation vineyards. Dan detects black tea and black olive components, which belong to Merlot. Decant it and it will really open up. 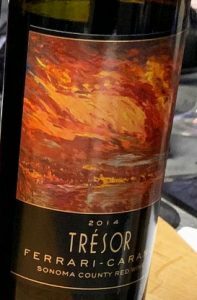 They taste the 2014 Trésor (which means Treasure in French). This has all five Bordeaux varieties in it. Mostly Cab, some Petit Verdot, Malbec, Cab Franc and Merlot. They pick their favorite little blocks from different vineyards. The label features a painting of a sunset that the winery owns. The title of the painting is “Tramonto” which means Sunset in Italian. It is a 2014 that is released now. Dan says that is the older tradition for Napa Valley wines in the 70s and 80s, not to release wines too soon. Today the demand is to have wines released after only 2 years, which they agree is too young. Tom calls it a heroic decision to hold the release back so that the aging in the bottle comes with the purchase. A listener calls to ask if Ferrari-Carano will ever bring back a white blend called Della Luce. It was a blend of Muscat Canelli, Sauvignon Blanc, Chardonnay, Viognier, Gewurtztraminer, Riesling and Semillon. Sarah says it was a decision by Don Carano not to make that wine anymoren but she loved blending it. The last wine they taste is a Cabernet Sauvignon from their Prevail label called Back 40. The vineyard is at 1100 feet elevation, the back 40 acres of the vineyard. Dan says the fruit is really there and it needs four or five years to mature, then may last 15 more years.